We just got back from a little vacation. We flew to Seattle and, for the first time ever for all four of us, drove south and visited the great state of Oregon. Our visit was mainly to Portland. Since we had never been there before we had plenty to see just in and around that city. We were also there for just three days, so there was only so much we could do. In comparison to the desert where I live, Oregon was very green, which was a refreshing change for us. It was also nice and cool, compared to the 106 F it was the weekend before we left home. Finally, and craziest of all, they had two rivers in town and both had lots and lots of water in them! We have a river, too, but it is almost dry most of the time. It takes a considerable rain fall for anything more than a little bitty stream to run down our river. But there, why there were actual boats of a considerable size on the Columbia and the Willamette. We rented a small SUV for the trip. We ended up with a Nissan Pathfinder, after they tried to get us to take a bus, I mean a Town and Country (not so ) minivan. I am sure I have mentioned before that I have a very funny family. Well, we jumped in that Nissan and off we went, and then Eldest Daughter found a Fruit Loop in one of her cup holders. It wasn’t just any Fruit Loop, it was a blue one. Well her riffs on blue Fruit Loops kept us laughing for several miles. 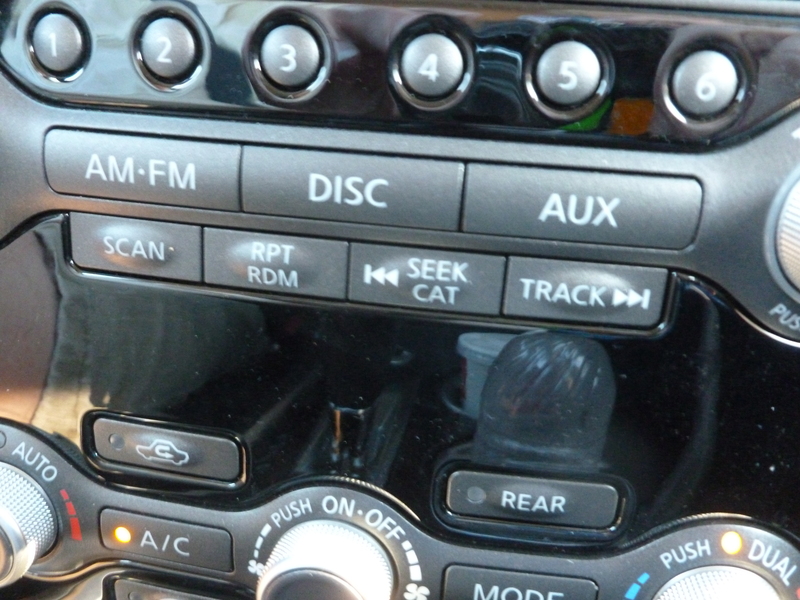 Another thing that kept us laughing was the button I found on the radio/dashboard of our rental SUV. It was great for cat lovers like us. Here is a photo. Can you spot it? Yes, the Pathfinder has the unique feature of being able to find cats for you. 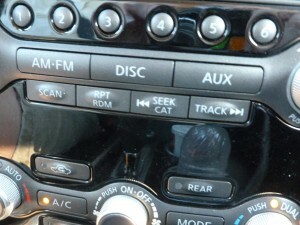 Well, the button said “Seek Cat!” But no matter how many times we pushed it, all we seemed to see were dogs. There was a beagle, a standard poodle, a pit bull puppy, and many more. But, until we got to our friend’s house in Seattle the second to last day of our vacation, we didn’t see a single cat! They have two cats, so that helped make up for the total failure of the “Seek Cat” button. As I upload my photos and think back on our trip, I will tell you more about what we saw in and around Portland. Until then, I hope the rest of your weekend is a good one!! !